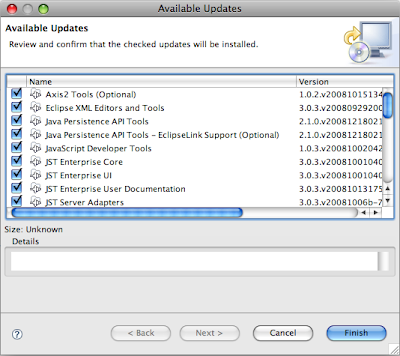 For the last month or so, Eclipse has been bugging me to update. Like the fool that I am, every couple of weeks, I click the update icon and get this Available Updates window which seems full of all sorts of potential nifty bug fixes and feature additions. Clicking on the Details button, I get this dialog which does nothing to help me resolve the issue. Dear Eclipse, why do you tease me so? 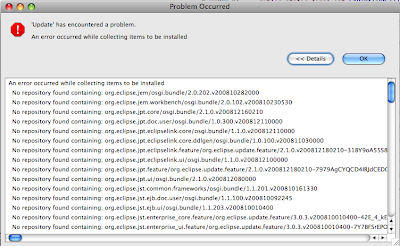 You might want to try just installing the Eclipse Platform updates. There are a bunch of Provisioning fixes in there...or better, you might just want to download Eclipse 3.4.1 and then install the packages you need. I am running 3.4.1 already. Every time I try to uncheck one of the items to install, it pegs one of my cpus at 100% and takes 30 seconds to compute all the missing dependencies. It looks like you are having problems with the WTP update site. So I would suggest opening a bug with WTP and see if they can duplicate the problem and get it corrected. See, that kind of bugs me. I have a default J2EE install that I've only added Subclipse to. I have made no other relevant modifications to it. I can't see how others aren't having the same problem. Instead of spending more time opening a bug and tracking it, I'll just download another 150meg copy of Eclipse and try to use that instead. Hi! Yes I feel your pain, these bugs are annoying. You must already know this but if you don't - in your workspace there a .metadata folder and .log file in it. It will often contain exception stack trace when Eclipse frontend displays an error message. Not that would help you a lot but this will a tangible artifact that you can attach to a bug report - should you like to do that. I'm using the eclipse 3.4.1 aka Ganymede SR1. I also had this same error, I deleted the folder 'metadata' in the workspace, I created another, did the update and worked.